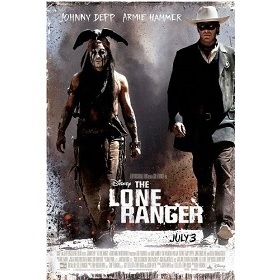 The Lone Ranger is a Western movie starring Johnny Depp, Armie Hammer, and William Fichtner. The movie was directed by Gore Verbinski and released by the Walt Disney Studios Home Entertainment studio on 2013-07-03. The movie has an MPAA Rating of PG-13 (Parents Strongly Cautioned). Our users found the overall impression of this film to be Confusing. The movie's official site can be found at disney.go.com/the-lone-ranger. Too many movies today suffer from a non-stop break-neck pace, special effects and stunts that are over the top, and with all the mayhem, the story is relegated to a frame to hang the thing around. So it is with the latest incarnation of the The Lone Ranger, directed by Gore Verbinski and starring Armie Hammer as the Lone Ranger, and Johnny Depp as Tonto. The film begins with a device lifted from directly from the Ben Stiller, Night at the Museum films where a little boy dressed in western garb and a lone ranger mask wanders into a side-show tent where Johnny Depp comes to life from a carny canvas. The little boy Mason Cook is used through out the film and gives a good accounting of himself in each of the roles he plays. He will be back in the future and we look forward to it. Armie Hammer’s Lone Ranger is a strangely bland character who sleepwalks through much of the film, wakening briefly to become a schizophrenic figure who cannot make up his mind whether he want to be an outlaw, or Sheriff Matt Dillon cleaning up the west. Johnny Depp, is always entertaining. He plays Tonto like a reincarnation of “It is a good day to die,” Chief Dan George, and Jackie Chan with a shot of Circque du Soleil to boot. The scenes on the steam locomotive are the most interesting part of the movie, – they are entertaining, if improbable. The evil railroad executive, Tom Wilkinson, is a predictable greedy and self-centred character business man determined to drive the Commanche from their land now that precious metals have been found in abundance. The one scene early on with a herd of Bison running alongside the train was well done, if sad and poignant given we know these magnificent creatures will face near extinction once the transcontinental railroad is complete. The most memorable cast member, William Fistchner, plays bad-guy Butch Cavendish, who is as nasty as any outlaw spawned by the Cohen brothers film. With a tortured upper lip severed before the film began, his filthy teeth, mean eyes and evil disposition he is perhaps the best character in this mess. There are incidents of precipitous violence that are out of place in afilm more akin to the Marx Brothers go west. Johnny Depp indicated on a recent interview on David Letterman, that he wanted to put right, certain misconceptions about the native people. All he accomplishes is to reinforce a new stereo-type of natives as seers, and smoke and mirrors, with a sardonic sense of humour and nine lives to boot. No wonder the Lone Ranger has stumbled out of the gate as if the public could smell it coming. It will likely make its way quickly to DVD. If you must see it - wait for that. I give it two and half stars.